No matter what type of roofing style is specified, All American Exterior Solutions® has been delivering unprecedented quality since 1985. With the backing of major brands and awards, you can feel confident when All American Exterior Solutions® is on your jobsite. 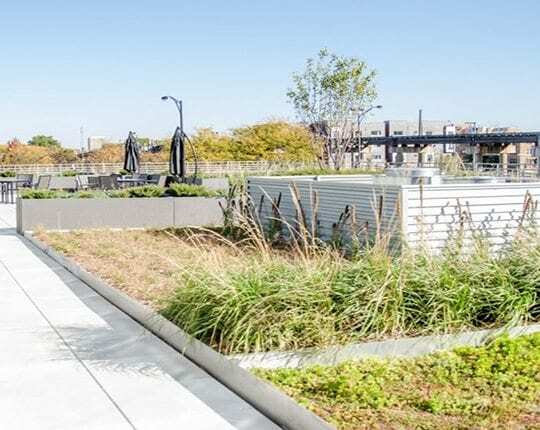 When you need an ecologically sensitive alternative to standard gravel, shingle or tile roofing, our green roofs can protect the basic concrete integrity of the roof deck while providing a watertight and sustainable surface. There are a few different kinds of green roofs. Hot fluid applied, also a form of waterproofing, can provide a variety of vegetation from ground cover to small trees depending on the depths of the soil. Vegetated mats can be rolled out onto single-ply membranes and can contain short growing turfs and sedum. Vegetated tiles and trays are the quickest and simplest way to add a touch of green to your new roof or even to an existing roof. All American Exterior Solutions® is one of the few firms in the Chicago area certified in green roof installation. All roofs are LEED certified where required by code. 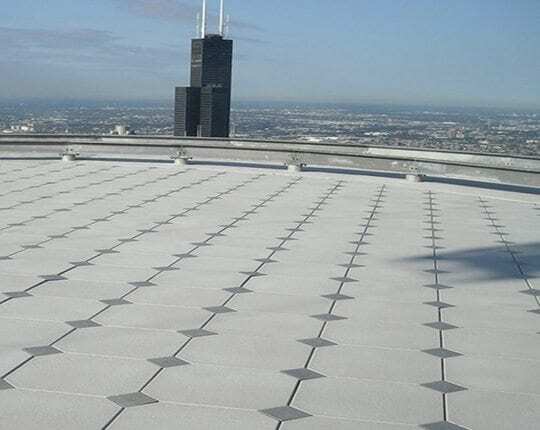 These hot fluid applied roofing systems include waterproofing protection in the form of a hot fluid-applied rubberized asphalt membrane, overlaid with polystyrene insulation to provide R-values in accordance with building codes. 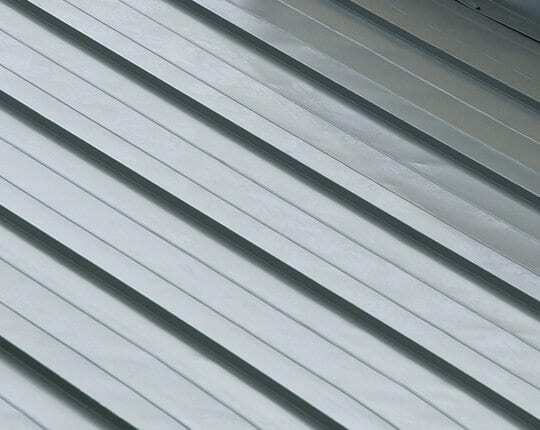 A drainage layer draws excess moisture away from the roof structure. The top surface of our green roofs may include pavers, flagstone or other terracing materials. If you will be using vegetation on your top layer, a filter layer and root barrier are installed on the drainage layer to prevent roots from penetrating the waterproofing below. The surface is an engineered mixture of clean topsoil, compost and inorganic material. Vegetated mats are a quick and cost effective method of obtaining instant vegetative coverage on your building’s roof garden. Applied in a similar manner to laying sod out for a yard. A good quality of the mats is that the vegetation is already grown and instantaneously green, thus reducing the plant maintenance and waiting for the plants to grow. Vegetated tiles and trays are the fastest and easiest way to achieve full vegetative coverage on a roof garden during the day of installation. The tiles and trays usually come in a rectangular shape and are laid out right on the roof membrane. These also eliminate plant maintenance because the plants are already fully grown. Removing the tiles and trays is just as easy as they are to install for roof maintenance underneath the green part of the roof system. An urban heat island (UHI) is a metropolitan area which is significantly warmer than its surroundings. As population centers grow in size from village to town to city, they tend to have a corresponding increase in average temperature, which is more often welcome in winter months than in the summertime. Not to be confused with global warming, scientists call this phenomenon the “urban heat island effect”. Heat islands form as vegetation is replaced by asphalt and concrete for roads, buildings, and other structures necessary to accommodate growing populations. These surfaces absorb rather than reflect the sun’s heat, causing surface temperatures and overall ambient temperatures to rise. The soil and plants on a green roof add insulation, increase energy efficiency, and absorb sound. Field studies in Ottawa, Canada, found that a 6-inch-thick green roof reduced heat gains by 95% and heat losses by 26%. Studies in Europe show that workers in green offices are happier, more productive, absent less often, and stay with the company longer. The building owners, in turn, are able to charge more for space. (Waterproof magazine, winter 2008). All American Exterior Solutions® offers a wide range of roof shingle installation options for your commercial or residential property. 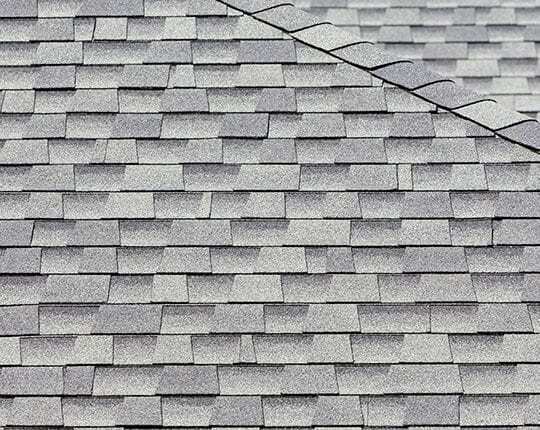 The shingles we use are durable, resistant, and of the highest quality. And, because of the large variety of styles and designs we offer, you can be sure you’ll find one that is to your liking. So whether you need to install new shingles on your roof or replace the ones you have now due to any type of damage or decay, you can trust All American’s 40+ years of roof installation and repair experience to do a beautiful job on your roof. All American Exterior Solutions® is a professional roofing and siding contractor since 1975. We serve the entire Chicago area, Northwest Indiana, and Southwest Wisconsin. We specialize in residential and commercial roof installation, roofing repair and siding repair industry. © 2019 All American Exterior Solutions. All Rights Reserved. Roofing License Number - 104002762.